Director Suite is CyberLink's most powerful post-production suite, which includes PowerDirector 13, PhotoDirector 6, ColorDirector 3, AudioDirector 3, PowerDirector Mobile for Android/ Windows 8 and $800 worth of premium effects. 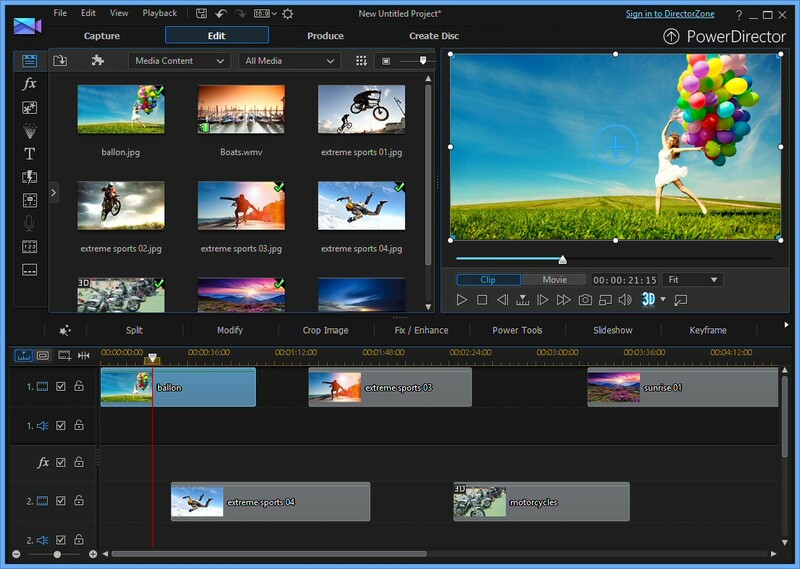 As with previous releases, PowerDirector 13 provides everything you need to create professional videos, complete with soundtrack, transitions, special effects and more, before exporting your project to a file, sharing it online, or burning it to disc, complete with your own custom menus. New additions include custom Transition and Titles designers, H.265/HEVC, 2K/4K and XAVC-S import/ export support, better image stabilisation, a more powerful menu designer, and new support for automatically synchronising up to 100 camera clips on the timeline. The suite also includes PhotoDirector 6, a powerful tool for transforming regular images into polished, professional photos. This now includes a panorama creator, intelligently stitching together multiple images to spectacular effect. A quirky Face Swap feature automatically picks the best faces (biggest smiles, clearest eyes) from multiple group shots and merges them into one. Unsurprisingly, the end results vary considerably in quality, but it's fun to try. More conventionally, there's a new Skin Tone tool, a Radial filter and Grain effect, along with 36 new lens profiles for even better image correction. New integration with CyberLink Cloud means you're able to back up your projects or source materials to 20GB of free (for 1 year) online storage space and access them from anywhere. The suite also includes ColorDirector, a professional colour correction tool which uses advanced motion tracking to help enhance, correct and adjust the colour temperature and intensity of your videos. Finally, AudioDirector is a capable and very complete sound designer which can apply special effects to your soundtrack, repair audio problems, record custom audio, mix tracks and more. You also receive the PowerDirector 13 Ultimate benefits, including 3 Creative Design packs and much more. Note that you receive the full Director Suite 3 build after purchase, which is approximately 5.7GB with all the extra content. The trial download here is much smaller. There is no backup/install disc option for Director Suite 3, it's download only. 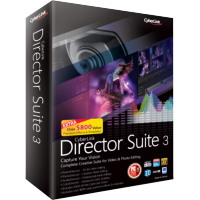 Director Suite 3 is not available from retail. Note that you receive the full Director Suite 3 build after purchase, which is approximately 5.7GB with all the extra content. The trial download here is much smaller.